Chris and I made it four years, ten months, and three days into our parenting career without crossing his threshold. And we were well pleased with ourselves. Then we received an invitation to a good friend’s son’s birthday party. A friend that Ali would be disappointed to miss his celebration. He had been begging his poor mother all year long to have his birthday at Chuck E. Cheese, and despite her attempts at helping him pick a more lovely place, his heart was set. 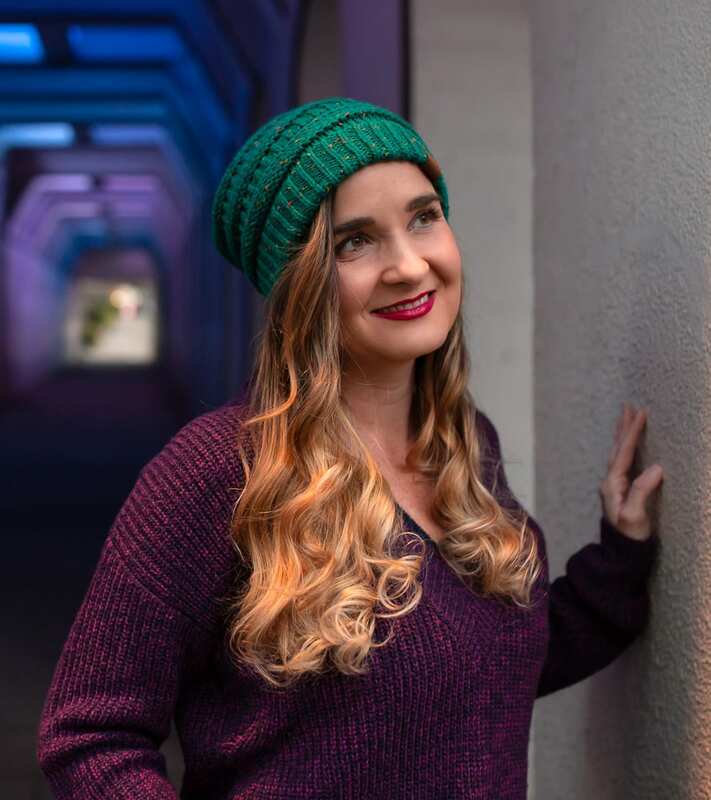 I didn’t think about the invite for too long – I knew Ali would be thrilled to go, and my parental guilt of not taking my kid to the place Where a Kid Can Be a Kid earlier in her life temporarily eclipsed my intense desire avoid that GermHole at all costs. Plus, it couldn’t be as bad as I imagined, right? I was so deluded in my planning for our attendance that I even nonchalantly agreed to take both kids alone if Chris wasn’t able to leave work early enough to join us. Fortunately, God did not smite me that ruthlessly. We set out as a family to The Chuck. Our first clue of what was to come should have been the fact that there was nary a parking spot available. No, all of those cars definitely weren’t there for the eerily empty looking Japanese Steakhouse next door. Nor were they there for the ABC State Liquor Store on the other side. 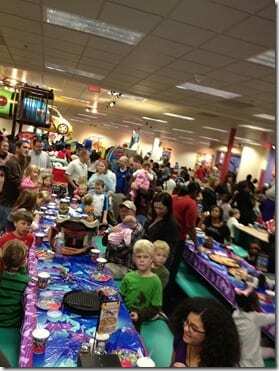 No, all of those cars were there because the fire code was being grossly violated at none other than Chuck E. Cheese. Chris dropped Ali and I at the door, and he and Noah set off in search of a faraway and mythical parking space. Ali and I crossed the threshold. …and were both immediately in shock. I have been to the Circus. I have been to the mall during Christmas. I have been to many Alabama football games with the attendance over 100,000. But I have never seen so many people crammed into so little square footage in my life. And there was a very distinctive odor. So distinctive in it’s unique mixture of vomit, feces, and germs in their most natural form that it was the first thing Ali pointed out. Maybe this was all because it was a Friday night… and Veteran’s Day… and that they had obviously booked as many birthday parties in one night as would possibly fit in their building AND the empty steakhouse next door… but whatever it was, it was more shocking than I could put into words. After several minutes of trying to schematically figure out how it was possible, Ali and I squeezed and pushed our way through the multitudes to find our party. We got some tokens and headed into the Corral of Crazy. I am no germophobe, but the inch-thick layer of grease (that I’m sure could be grown out in a lab to reveal several new mutations of filth) on each and every arcade game about did me in. However, I held in there, began to get amused by the situation in which I found myself, and dove into the deep end of the germ pool. A few days later after finally finding a parking spot and fighting his way through the front door, Chris and Noah found us. I barked out stringent orders to not let Noah come within eighteen inches any surface anywhere, and Ali and I went back to playing. Then Ali saw the PlayPlace in the sky. Chris stole a few tokens and headed to the Skeeball machine, leaving me to commiserate visit with some other Mommies and watch for Ali in the windows above my head. A few minutes in, I could see that the other guests were beginning to congregate in the birthday party area. I watched for Ali to pop up in a window, and when she did, I waved for her to come on down. At which moment, she realized that she didn’t know which direction to crawl to get out. She was only around one corner from the slide and the stairs, but she inherited from her mother a gene of panic-first-when-out-of-control. And I saw it happen, in silent slow motion. She had a meltdown, up in the sky tunnel. She began crying, which drew a crowd of other tunnel dwellers around her. But Ali also has a severe issue with her personal space being invaded by strangers. So the crying turned to weeping, and the weeping turned to screaming. All silent, of course – at least from my spot on the ground. I’m pretty sure it was reverberating nicely in the tunnels, though. I tried to silently comfort her from my spot and point profusely in the direction in which she should crawl. Complete panic, no room to pay attention to me. One of the other Mommies sent up her daughter, a year older than Ali, to retrieve her. Ali loves Abby – surely this would work. I watched as Abby arrived at Sky Zero and began to comfort Ali and tell her that she knew the way out. Nope – she was completely frozen in her all-encompassing panic attack. More kids were crowding around, except this time they looked angry with the panicking, tunnel-barricading child. Ali reached for me, crying pitifully. The way up to the tunnel were those half triangles that are purposely impossible for adults to snake through – I am pretty sure I had to bend my backbone in four different directions to weave up eight levels of germy plastic to make it to the tunnels above. I finally made it up, and was gaggingly horrified at the thick layer of dirt, mud, probably a little poop, and botulism that coated the floor of the tunnel. I wish I were exaggerating, but it was thick, dark, and I had to put my hands all up in it to crawl to rescue my daughter. As I was turning the corner, I heard a kid screaming obscenities. He was coming around the corner towards me, still screaming with his head looking back over his shoulder. AT MY DAUGHTER. He saw me, and instead of getting polite in the presence of an adult, he started screaming at me. That kid was so lucky that there was a slide at his feet. He popped through it and disappeared, as I began to shake with lividity. I reached my hand out to Ali and led her back around the corner to the stairs made for invertebrates. We made our way down together, her crying, me boiling with horror and anger. Of course, by the time we made it to the bottom, the eight-year-old cuss factory had disappeared into the masses. I picked up my poor, sweet, innocent, panicking daughter and held her close. She told me in my ear that she got stepped on – twice – and that it hurt. And that kids were mean to her. I managed to not begin weeping with her and apologized for the fact that there were awful, nasty, mean kids in the world. We both made it to the birthday party, at which point I showered Ali in hand sanitizer, and she was soon lost in eating Pizza and birthday cake and watching a six-foot-tall electronic mouse dance the night away with his fake and nightmarish smile. Fortunately, children are infinitely more resilient than there parents. Because I can guarantee you that I was the one that left the most traumatized that night. …Well, me and the poor Mom who had to throw the birthday party – her row was a far worse one to hoe than mine, and she deserves the hugest of Mommy Scouts Badges for making her son’s birthday dreams come true. But the next time we saw each other on Sunday morning, we pinky swore (or the Mommy equivalent of pinky swearing, anyway) that no member of either of our families would ever, ever, EVER step foot into Chuck E. Cheese ever, ever, EVER again. The Sequel can be found here. Next Post On Meeting The Party Friends. Poor Ali! The whole thing sounds horrible. I remember getting lost in a hall of mirrors at a fair with my best friend when I was about 6 or 7. We just could not find out way out, and when we finally thought we did, it was a door out to a balcony hanging precariously off the side of the building, where we proceeded to stand and cry until her dad finally came in and found us. Being lost and stuck and feeling panicky is bad enough without mean kids. Oh that does sound like a nightmare!! Are you sure it wasn’t just a nightmare that you think was real?? Eeks!! I had so many parties at the Chuck when I was a kid. I don’t remember it being that bad. I’ve since gone back once when Abiah was three. We will never darken the doorsteps again. NASTY! Sorry for Ali! A little girl stuck her tongue out at Hazel yesterday for no reason and Hazel was so upset. And I found myself getting all Momma Hen-ish. I can’t imagine being in your situation. It’s so hard to see your kid picked on!! We’ve just not been in that situation much – I don’t know how to handle it! Hopefully we will continue not being in it much. Poor Ali and you! I still have nightmares from my childhood experience at Chuck E Cheese. I am a slight germ a phobe and I have big personal space issues so it was a nightmare. I so completely understand Ali moment of panic and meltdown. You deserve a badge for not yelling at mr. cuss factory. I would have not been able to contain myself. I can’t stand mean kids especially ones that disrespectful. sooooo sorry you had to end your non-chuck-e-cheese streak. Fortunately, Eden got her CEC fix via the grandparents, saving me from having to go. She says its her favorite “restaurant” but fortunately we live about 12,000 miles from the nearest one so we have a good excuse for not taking her! and due to your botulism finds in the tunnels, I’m not sure I’ll ever let the kids enter any of those things EVER again! O my gosh!! I have issues with Chuck E. Cheese anyway because of a bad experience during my own childhood. Not to mention the recent study of germs/bacteria found on indoor playground equipment around the U.S. that has been on the news. But there is a line that was CLEARLY crossed by the excess crowd + unruly cussing brats + the fact that none of the equipment is designed to allow adults access for any reason (be it an injured, frightened, or lost child; to SANITIZE the equipment; or to rescue a kid during an emergency)! I totally agree with Leanna that you deserve an award for having maintaining self-control when Mr. Cuss Factory yelled at Ali AND you! Seriously about the non-adult access!! That’s just bizarre and unhealthy in so many ways. That sounds horrible!! Poor Ali and poor you!! We have gone there a lot of times, and it has generally been a good experience, but we always go on weekdays, during school, as soon as it opens, and if the parking lot is too crowded…we go home. If you get there for the 1st hour or 2, it is just a handful of pre-schoolers and their moms, it is clean, and it isn’t loud or smelly. If you DARE to go later in the day, on the weekend, when the parking lot is full, or (horror of horrors) if there are buses/vans, you are risking your health and sanity. I am so glad that you shared this post. My eight year old is always asking to go and we keep telling him that he is to big. I highly recommend TreeTop Adventures on 280. It is wonderful and has lots of games and it is CLEAN. It also has outdoor activites. I hope Ali and rest of the family are better now that this experience is over. Please say a prayer for the little kid that was awful. With words like that coming from his mouth, the kid must hear and see alot that he should not. I am sure he needs a high power watching over him. Treetop Adventures IS wonderful! We’ve had two great experiences there. And you’re right about that kid – that’s one of the reasons I didn’t say anything to him. Grrrr…I’m angry just hearing about the cuss factory kid. And frankly, saddened. Obviously his home life is less than stellar. Maybe it was good he disappeared into the filth, otherwise you would have had to go down the “what to do when a kid is bullying yours” flow chart and figure out what to say to whom and refrain from physically hurting someone! Oh, I can so relate to this! We took River a few months ago as a prize for stopping sucking his thumb and it was just as horrible as you say. I should have guessed when we dropped Willow off at my in-laws and they cackled mysteriously when we told them where we were headed. We went on a weekday evening and although it wasn’t crowded, it was SOOOO nasty and at least half the arcades were broken. There were very few table available because the tables obviously hadn’t been bussed all day and most were covered with trash and food. I was so angry that I sent an email to corporate detailing my complaints. They send me a coupon for family pack so we could go back for free, but I don’t think we’ll ever grace the door again. Still, you should forward your post to them. It’s a shame that it’s so bad! I also hear that TreeTop is nice, but for those of us who live north of town, it’s so far. Yuk! Yes, a coupon would go unused by me, as well. Oh yeah, all it took was once for me. The second kid got gypped, but no way was I going to attempt another hamster tunnel toddler recovery. I love the “kiddie casino” reference! Thank you, thank you, thank you for this public service announcement. I always figured CEC was gross, but after your description I will never, ever go there, no matter how much the little one begs when she gets older. I absolutely couldn’t handle that filth, not to mention how crowded it was. That really sounds like my own personal vision of Hell. Bwahahahaha! I miss The Cheese! With a 17-year-old and 13-year-old, it’s been at least 7 or more years since I’ve been there, but I’ve been through those tubes more than once. Just a word of advice -if you (or anyone you know) ever contemplates a party there, take the earliest time available on Saturday. I know you think “Saturday! Are you nuts?” Trust me on this, if you can get the 10 or 11 a.m. slot, everything is clean(er) than any other time. They do clean at night, but you can’t clean while folks are there, so a night-time party means you will have the whole day of putridity before you, which isn’t threw case with a Saturday morning party. Why do I get the feeling you aren’t taking notes, here? It’s night and day on weekdays compared to weekends but that doesn’t change the germ factor. Do you guys have Monkey Joes? They are a cleaner but still as crazy kids place. They advertise that their blow ups are sanitized every night. So sorry it was SO bad. I don’t know what I would have done if I were you!! Good for you for holding it together. Nope, we don’t have Monkey Joe’s. We have some other blowup places, though, and they seem much nicer than CEC. Wow, I think your Chuck E.’s is a LOT worse than ours! Both the ones in our town have been built within the last five years and they don’t feel dirty at all…on the contrary they feel very sanitized and have the little hand sanitizer stations all over. I have never seen any dirt/mess/garbage etc. that wasn’t cleaned up quickly. I think that is also a Northwest/Southwest thing though. Every time we go to Texas my mom and I are horrified by how dirty things get as we go further South. You can visibly see cleanliness factor start to drop, most noticeably once you pass Denver. The state of restaurants and bathrooms gets awful. Must be a cultural thing?? No idea but it is horrible. We are always so happy to get back to the Northwest where everything is clean and most places of business are either new or recently remodeled. Most places up here just have that “clean” feeling. I can’t beleive that kid was yelling at Ali like that! How awful. That is so sad because you know that someone has got to be yelling at him like that, and worse, for him to do it so boldly to others. So sorry you guys had to go through that! My husband and I made THE PACT last night as we drove past The Chuck that our children will never know its existence. This just put an iron clad on that pact. That is a very valuable pact!! It will protect your children from numerous ailments. Ack! That’s awful. I really don’t know why I let her get in the tunnels – WAY too far away from my control. Well….you saw the first comment from my dd, and she has been once in her 17 years….and like you, we went once and promised we would never return again! Wow, that sounds horrific! Poor Ali and poor you. I would’ve been wanting to scrag that rude kid! My only experience with Jackson at Chuck E Cheese was this summer. It was on a weekday and it was actually a decent place. However…when I taught daycare I had to take 12 school age kids on a field trip to chuck e cheese by myself. They had a huge video karoke screen set up and as I was trying to get the pizza lunch divided up, I glanced up on the huge big screen tv and saw 2 of my girls getting into a hair pulling, knock down, fist fight for the whole restaurant to watch. Good times. By YOURSELF??? That’s insane!!! No one should have to endure that!! I would have to stop by the ABC store before I could go in there again. I hate, hate, hate it. With a red-hot passion. Oh..my..goodness. I want to give Ali a hug just reading that. How are kids so cruel these days?? Can you imagine how their parents act?! It’s a scary scary world we live in. I actually have good memories from that Chuck-E-Cheese. My pawpaw used to take my brother and I there when we were little. I don’t remember it ever being ridiculously over crowded and dirty and smelly though. I guess it’s gone downhill from the sound of your experience. I’m sure the fact that I had a big brother to stick up for me in those dark tunnels helped :) . And the germs…ew. 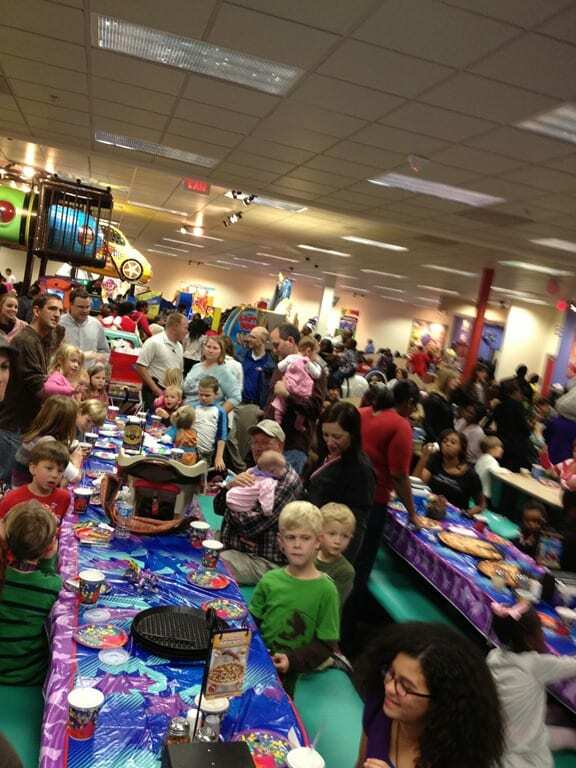 Future reminder: do not bring my future kids to chuck-e-cheese. Yeah. Don’t go there. Don’t ever take your kids there. You will regret it. I loved “Show Biz Pizza” as a kid, remember when it called that? 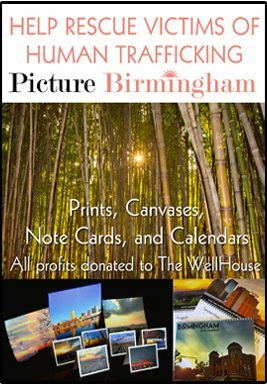 My mom would never take me, so I always looked forward to coming to B’ham to stay with my cousin b/c her mom often took us there. I have wanted to take the kids there b/c I enjoyed it so much as a kid, but thought it would probably be totally disgusting now that I’m a parent. Thanks for sharing this, we’ll never take the kids now! and now you know why they sell beer at Chuck E Cheese. OMG. There are no words. My husband and I HATE Chuck E Cheese too, but we have never had a situation like yours! Thank God your daughter never wants to go back in there. We use to call it UP-CHUCK E CHEESE because every time we went there one of our boys would get sick…. Still makes me shiver to say the name…. I feel so sorry for Ali, because of that mean kid! 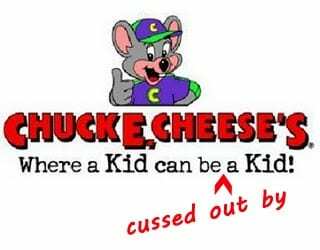 I’ve never liked Chuck E. Cheese’s, and in particular I hate that the mascot is a creepy rat in a cut-off T-shirt and baseball cap. Their mascot may as well be named Sandusky, in my opinion. CREEP-Y. We stay away from there as much as possible! That sounds horrifying. I could just picture Ali up there feeling upset and alone. No wonder you don’t want to go back. We were just there last week for a birthday party. Luckily the parents had the notion to have the party on a random Thursday so thankfully we didn’t experience the fire code violation crowding like you. But, still…..not a place I frequent on my own accord. Kids are mean and we found out during our trip that parents could care less too. Hense the two year old little boy who wandered to our party table to have some cake….nar a parent looking for him. Jenna will be five next month and there is NO WAY she would be roaming around by herself. Long story short it took the CEC staff 30 minutes of walking him around asking every adult asking if this was their kid to find his momma. We’ve been once for a t-ball team party–and w don’t ever intend to go again! You’re all so right about parents not watching their kids. That infuriates me only slightly less than the 4 year old boy who ran to every game with a ball that my kids played and grabbed the balls and started playing himself. I kept telling him no and ended up taking the balls and giving them to my child. Why was he wandering around unsupervised? Then I realized he had learned to do this. He was still there when we left and was doing the same thing. He must have played all night for free. It was the perfect crime. My husband just reminded me of the cherry on top that evening–no one was at the door when I walked in with my kids so I didn’t get the stamp or whatever you are supposed to get. When we were leaving they stopped me and said I couldn’t take my boys out. I appreciated (later) this “security” measure but at the moment I was furious! Where are their security measures to stop 4year old game grifters? (I was just about to pull out pictures of my sons when she said she “guessed” I was ok to take them. Well, thank you very much! Ali and I missed the hand-stamper, too!! We got our hands stamped when we went and met Noah and Chris at the entrance. I don’t know what they would have done otherwise! I. HATE. CHUCK. E. CHEESE. HATE. HIM! We visited once and every time my son even begins to mention the place I quickly distract him with something shiny. I can’t believe you actually had to navigate the tunnel of doom. I’m so sorry. I’m so impressed that you didn’t kick that kid in the face as he was trying to maneuver down the slide. GAAAHHH!!! Your description is right on target. I have been to Chuck E. Cheese twice in my life: When I was 9 years old, my cousin begged our grandma to take us to one in New Jersey, which was such a nightmare (very dimly lit, on top of everything else) that I vowed never to return. 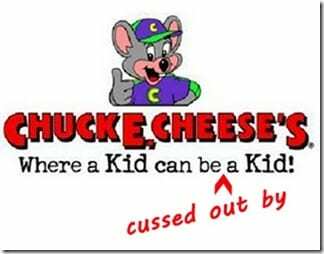 I didn’t until my son was invited to a good friend’s birthday party at Chuck E. Cheese in Bridgeville, PA, which was at least a little better than the other one, which is good because I was SIX WEEKS PREGNANT AND HORRIBLY NAUSEATED before I even entered that building! It’s only because the birthday boy’s father is a chef who had sneaked in some decent food, which we adults were able to enjoy unnoticed amid the flashing lights and shrieking, that I survived. It is a bizarrely scary place. My husband took Ali last weekend when I was out of town. He waited until AFTER they’d left to tell me, so I didn’t throw up a state away.